"Somewhere under the sea and beyond your imagination is an adventure in fantasy." The Little Mermaid is a Disney animated film about a young mermaid who lives in a world underneath the sea. Her father is the ruler of the sea and she also lives with five mermaid sisters and her grandmother. The Little Mermaid's beautiful singing voice is her one asset that sets her apart from everyone else. Ariel, the Little Mermaid, is bored with life under the sea and intrigued by humans. She has a collection of human artifacts that she has found over the years. She makes frequent visits to the surface of the ocean, even thought it is against her father, King Triton's wishes. It is during one of these escapades to the surface that she sees and falls in love with a handsome prince and rescues him from a shipwreck. Her beautiful voice is what wakes the prince and ultimately saves him. She is instantly smitten with the prince and wants to become human to marry him. The mermaid, longing for a set of human legs, is in a state of despair because she cannot be with the prince of her desire. A wicked old sea urchin strikes a deal with the mermaid that will give her the opportunity to grow legs in exchange for her voice. Desperate, the mermaid accepts the bargain and is transformed into a human. The only catch is that she has to kiss the prince within three days otherwise she will return to her mermaid form and belong to the wicked old sea urchin as a prisoner. The mermaid is at a small disadvantage in her human form because she is mute and cannot talk, thus she can't tell the prince it was she who saved his life. The lack of voice also makes it difficult to land a kiss from the prince. Other factors also pose as obstacles to the mermaid. The sea urchin has also turned herself into a human and plans on marrying the prince in order to keep the kiss from happening. 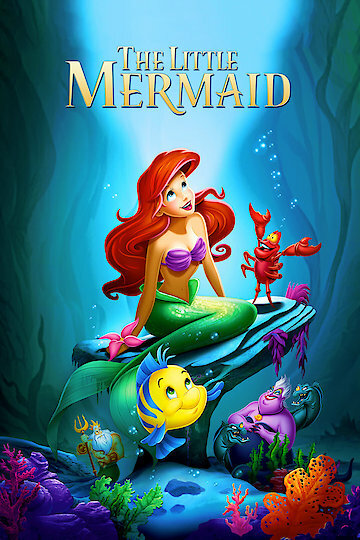 Ariel enlists the help of all her animal and mermaid friends and family to crash the wedding and in the process the shell holding her voice falls from the urchin's grasp and breaks, returning the mermaid's voice. She is able to sing to the prince and show him that it is her that saved his life but unfortunately the sun sets before they kiss and Ariel is returned to her mermaid form and a prisoner of the urchin. The rest of the story focuses on how Ariel is able to overcome and defeat the sea urchin and how she can marry the prince of her affection. The Little Mermaid is currently available to watch and stream, buy on demand at Amazon, Vudu, iTunes, YouTube VOD online.